Charity fundraisers don't come much hotter! Don't want to do that 25 mile sponsored hike... how about a short firewalk instead? Taking part in a Firewalk is not for the faint-hearted but what a fantastic challenge? Also what a unique fundraising idea. One that will really get people going. Raise the profile of your organisation. And bring in some really hot money! Walking on fire has existed in some shape or form for several thousand years and is found right across the globe. Often used as rite of passage or ritual of commitment it is the ultimate test of faith. Thankfully however there are some very good reasons (three cheers for physics) why it is possible for anyone to undertake a Firewalk without gaining so much as a blister. Joking aside if undertaken properly firewalking is completely safe and most participants really enjoy the experience. Setting up a Firewalk is however best left to experts and there are a number of professional companies who will be glad to organise a charity firewalk event on your behalf. It is usual that participants will gather about 2 hours before The Firewalk in order to learn a bit about firewalking and be briefed how to undertake their own ordeal with the flaming coals safely. Meanwhile the firepit will have been prepared in advance. This is usually a path of burning coals laid within the confines of a track cut into the turf of a sports ground or field. The coals have to be at just the right temperature before it is safe to attempt the walk. When all is ready the firewalkers will be led safely along the pit treading directly on the hot coals without burning their feet in any way. Turning a firewalk into a fundraising idea is easy although the costs of the company you use do need to be factored in. Usually walkers will commit a certain amount themselves for the opportunity to take part in something really different. They are also able to request sponsorship from friends and colleagues. The Firewalk also often forms the highlight of an entire social evening with other opportunities for an organisation to fundraise. Looking for an alternative that kids can do? How about walking on Lego? Check out our firewalking Pinterest Page to see what we mean. 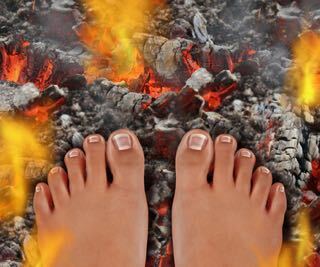 So if you're looking for a fundraising idea that's really hot stuff.................................why not try a firewalk!